Below is a separate form for Car Menorah Rentals in addition to joining the parade. We are excited to be starting a new opportunity to spread the message of Chanukah this year. 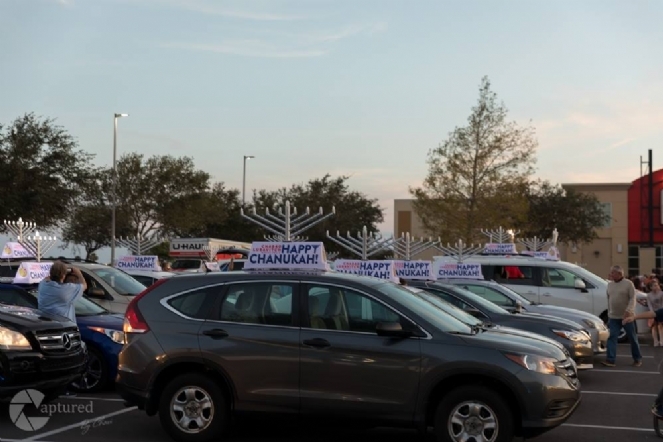 REGISTER your car to participate in the Car Menorah Rental. SCHEDULE a time on Thursday, November 28 to have your car menorah safely mounted to your car using our new magnetic and strap system. Call our office to arrange a time. SPREAD the Chanukah light throughout Brevard and Indian River counties and wherever you may be headed throughout Chanukah. PARTICIPATE in a car Menorah procession where all cars will gather and drive to a destination together. I agree to not drive my vehicle with the mounted car Menorah on Shabbat (Friday, November 29th - Shabbat, December 1st and Friday December 7th - Shabbat December 8th). The Menorah will be mounted to the car by Chabad and shall not be removed and/or remounted by any other unauthorized individual. I understand that the Menorah adds height and may not fit under some lower clearances such as parking or home garages etc. I understand there is a $100 refundable safety deposit in case of damage.